WASHINGTON (CNN) - The military expects to be ready to implement the repeal of the controversial "don't ask, don't tell" policy by midsummer, a top Pentagon official said Friday. Clifford Stanley - the Defense Department under secretary tasked with overseeing the repeal - told members of a House Armed Services subcommittee that the process will not be rushed "because we want to make sure that it's done right." But "at the same time, we don't want to take forever to do it," he added. Vice Adm. William Gortney, director of the military's Joint Staff, agreed with Stanley's assessment. We are "making sure that as we get our arms around the magnitude of the challenge, we don't miss anything," Gortney said. Friday's announcement was the first time the Pentagon has set a target date for the entire military to be ready for a repeal of the policy, which prevents gays and lesbians from serving openly in the armed forces. Roughly 200,000 service members - 9% of the total force - have been trained on how to handle the repeal, Stanley said. President Barack Obama, Defense Secretary Robert Gates, and Joint Chiefs of Staff Chairman Adm. Mike Mullen will ultimately need to certify that the Defense Department is ready for a repeal of the policy. At that point, a 60-day countdown would begin before the repeal was officially implemented. 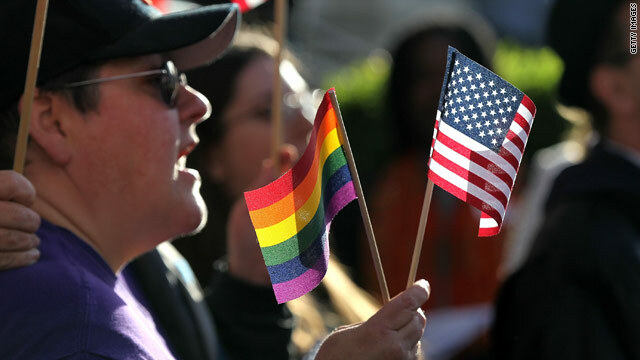 A recent Pentagon study concluded that allowing openly gay or lesbian troops to serve in the military would have little lasting impact on the armed forces. Opposition to the change was much higher in Army and Marine combat units than in the military as a whole. CNN's Alan Silverleib and David DeSola contributed to this report. Something that has strong support across parties, across every region of the country, and even within the military itself, is now considered "controversial?" What's funny is that if you substituted the word "black" (or at the time probably "colored") for the word "gay", today's arguments in opposition to DADT repeal echo arguments made over 50 years ago. Ignorance is theoretically cureable, but sometimes it's darn hard to achieve in the real world. I guess ignorance is pretty resiliant. I've never understood how anyone can disagree with DADT. If a person is willing to risk their life to defend our country they certainly should be respected and treated the same as any heterosexual. Right wing religious people who say God hates homosexuality because it is a sin need to remember God may hate sin-but He doesn't hate the sinner. They also need to remember judging is Gods' job not ours. He will do that in his own time-not ours. This should have been ready YEARS AGO!!! But I am glad that it is over now!!! All of our men and women who serve in the armed forces should be able to serve as to who and what they are....PERIOD! Thank you President Obama!! And this is yet another success story to add to your list!! In today's age of slash-and-burn, sound-bite-obsessed, 24-hour news cycle, anything with any kind of opposition is considered controversial. Course, that includes everything on the planet. And lately, of course, the GOP is overwhelmingly against repeal. about this issue. Because there would be NO issue. Proud member of "Global Zero"
DADT was the only reason my son did not sign up for the military. He will not lie. Thank you for moving on the repeal. Finally someone that gets paid on our tax dollars is doing their job. We just completed our DADT training for my unit (US Army) and just like I thought it was no big deal , just like it’s not going to be a big deal when its repealed in mid-summer. The 83rd Panzie Division, 1st Gay Brigade is ready to deploy. The poop-shoot is primed and ready. Get them weiners to attention.